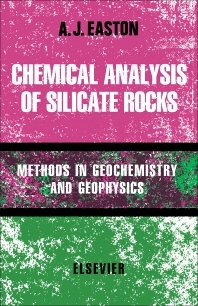 Correcting analytical results to the "dry basis"
Chemical Analysis of Silicate Rocks is the sixth book in the series, “Methods in Geochemistry and Geophysics.” This book provides procedures in chemical analysis of the principal types of silicate rocks and minerals, and it discusses each procedure at length. The book presents different apparatuses and reagents, such as balance and weighs, glassware and porcelain, platinum and substitutes, and filters that are used in the chemical analysis of silicate rocks. Laboratory instruments, such as pH meters, spectrophotometers and flame photometers, are presented in the third chapter. The fourth chapter focuses on the major factors in spectrophotometric methods. The next three chapters cover the common operations in silicate analysis, chemical analysis of silicate rocks, and preparation of the laboratory sample. From chapter eight through 20, each chapter discusses various silicate rocks and minerals, and presents the methods to be used for their chemical analysis. These chemical components are silicon, total iron, titanium, aluminum, calcium, magnesium, ferrous iron, manganese, chromium, alkalies, water and carbon dioxide, phosphorus, and total sulfur. Chapters 21 and 22 offer the formulas of minerals and the determination of specific gravity. The book closes by providing notes on the precision and accuracy of results obtained in silicate rock.